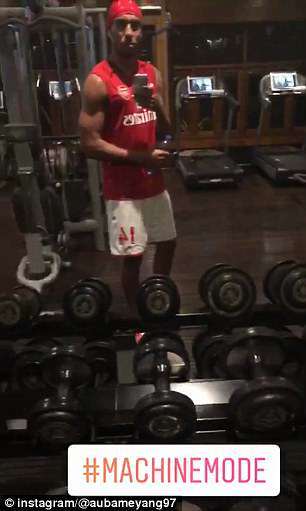 Pierre-Emerick Aubameyang shared a photo of himself working out in his Arsenal kit while on holiday. The striker is currently enjoying a luxurious trip away with girlfriend Alysha Behague and their two sons, Curtys and Pierre Jnr. The Gabonese star, his country’s captain, will be taking no part in this summer’s World Cup in Russia after his side failed to qualify for the tournament. 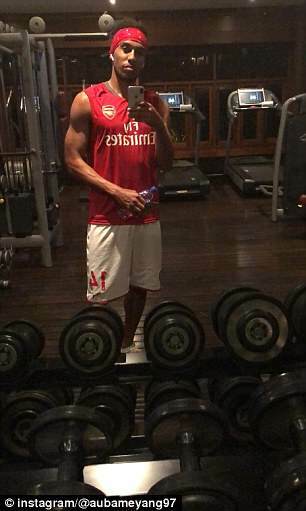 But Aubameyang is clearly intent on staying in shape ahead of his first full season with the Gunners, taking to Instagram to share snaps of himself in the gym in his Arsenal gear with caption ‘#machinemode’. The 28-year-old worked with some weights before hitting the treadmill for a 4.5km run at a variety different speeds. Aubameyang joined Arsenal for a club-record £55million in January after Alexis Sanchez departed for Manchester United. scoring 10 goals in 13 Premier League appearances.